Sunday is the day we do bee inspections. I have a rough bee note book that I write my observations in and tasks for the next inspection, but I think it might be helpful to keep a record here as well. Notebooks and stray bits of paper have a tendency to get lost in the chaos here! 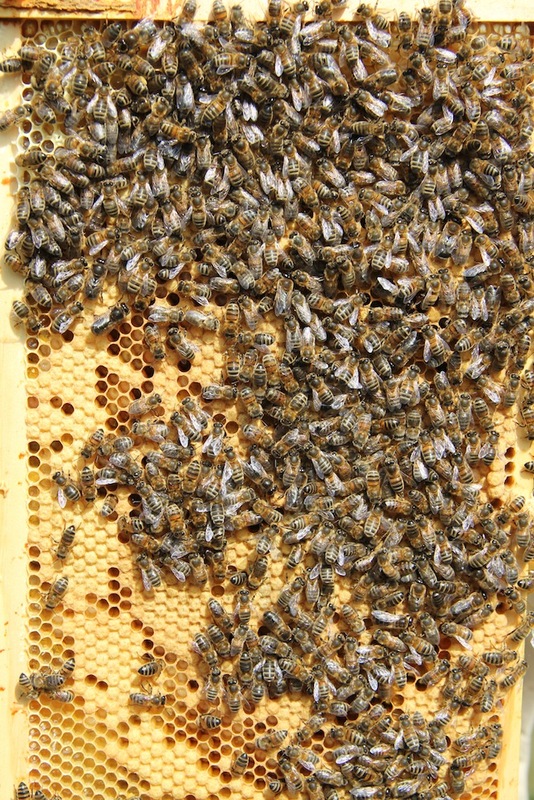 My mission last Sunday was to locate the Queen, check the status of the Queen cups we think we saw the previous week, and generally check all the frames for growth, brood, capped brood etc. 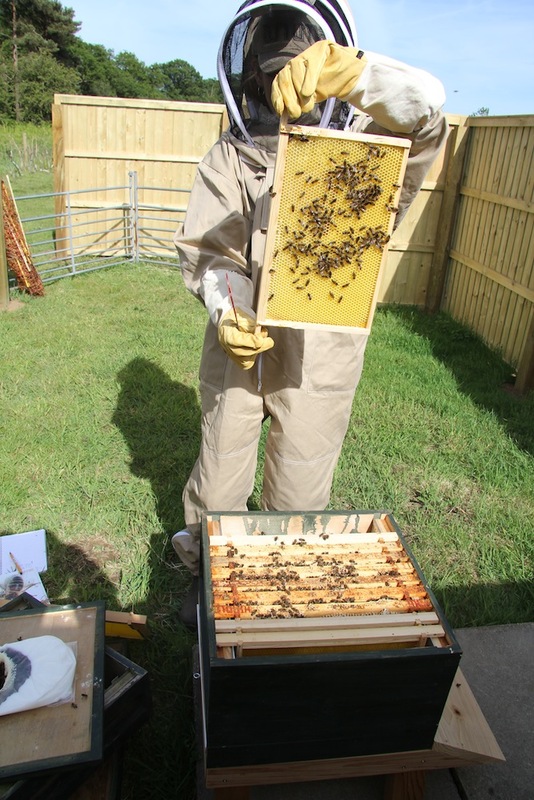 As you can see from the first photo our nucleus came with 6 frames and when we transferred the bees to the hive we added another 5 frames and a dummy (to stop the bees filling in the gap with propolis). This week I changed sides for the inspection so James could take some better photos. The first frame was pristine, had no bees on it and there was no evidence of the bees building it out. 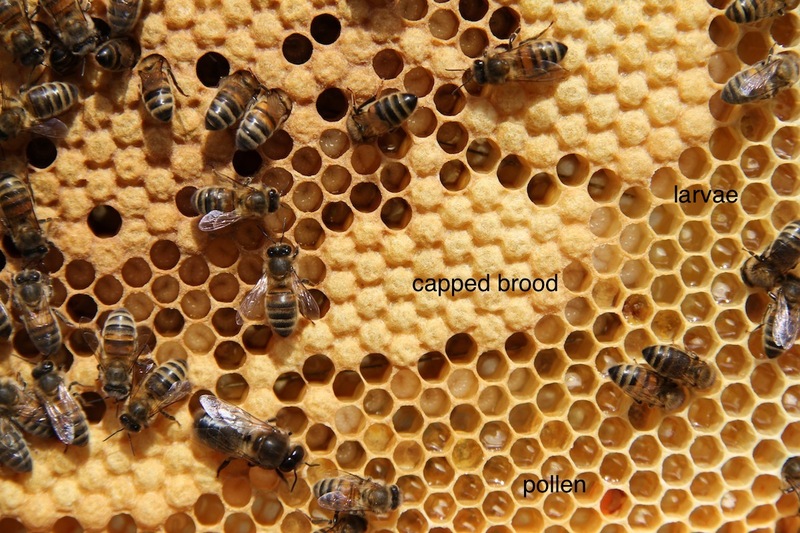 Frames 4-9 (the old frames) all had lots of capped brood and some larvae – and they had lots of bees on them. We found the Queen on frame 6. 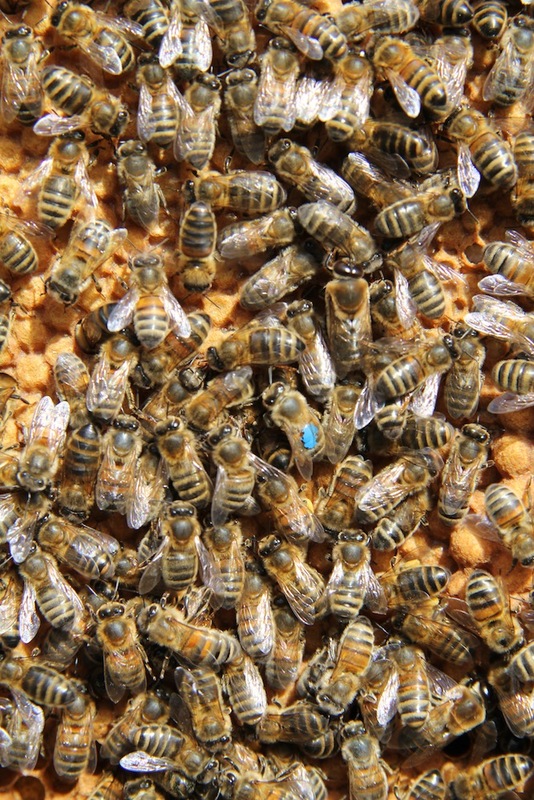 Well we think this is the queen because of the blue mark, but there is another bee with a blue mark on and perhaps that is the queen. I have been frantically looking at pictures in our bee book trying to work it out! Frame 10 (a new one) was built out with pollen and honey, and frame 11 was built out just a little. 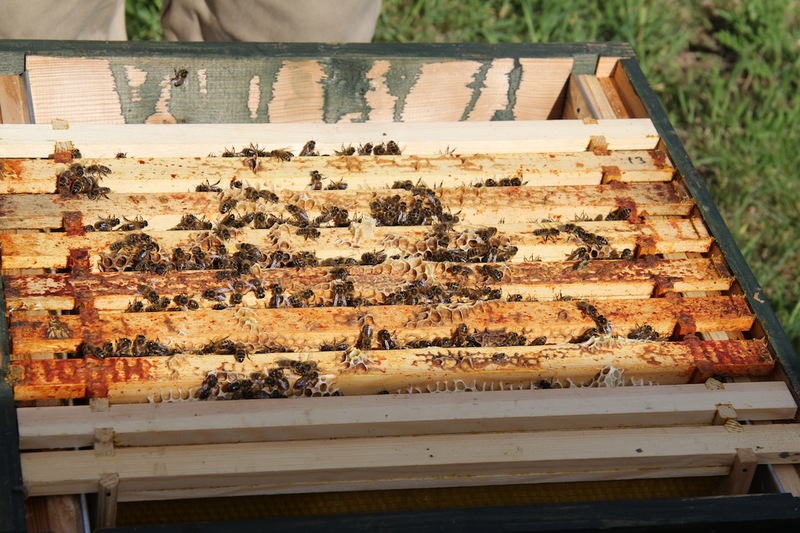 We cleared off some propolis from the bottom of the frames and from the fondant on top of the crown board. We also cut off one queen cup – or what we thought was a queen cup. I think we also have some sealed drone cells – but no photos of this. 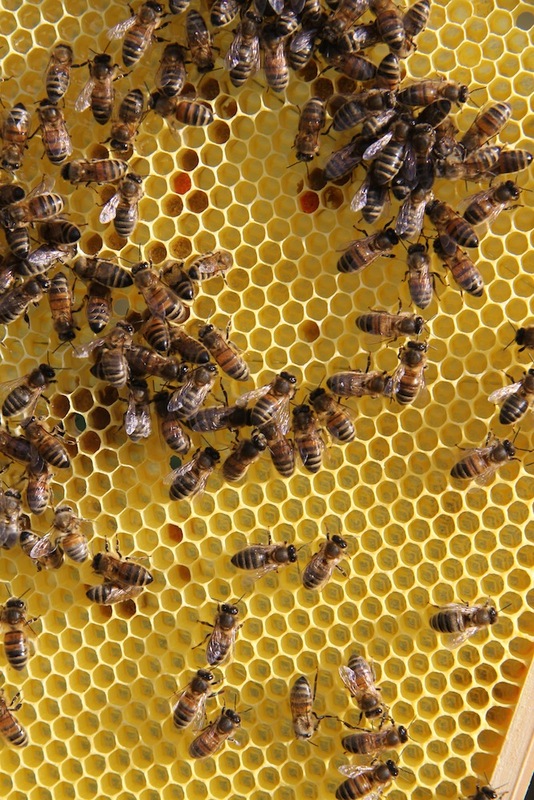 Next week we will try and determine which of the blue marked bees is the Queen. I also want to try and identify some eggs and young larvae. I think we may have drone cells so I will try and get a photo of these. We may also put on our first super. It is all quite difficult. I am going to start going on Saturdays to our local bee club to learn more, especially about swarming and honey extraction, but unfortunately this Saturday I have to go to London for a meeting. It is all very exciting, but a really steep learning curve as well! More next week ….